LONDON, UNITED KINGDOM, June 27, 2018 /EINPresswire.com/ -- After the growing success of SMi Group’s 18th annual Military Airlift and Air-to-Air Refuelling conference, a brand-new pre-conference focus day on Air-to-Air Refuelling has been announced for the 19th conference, taking place on the 3rd, 4th and 5th December 2018. The need to deploy forces on protracted operations has become a mainstay for defence forces attempting to project global influence. Whether extending flight time to maximise strike time for combat aircraft or to enable rapid and flexible deployment of troops and materiel tanking is now a fundamental competence for all Air Forces. The pre-conference forum is set to analyse: Automatic Air-to-Air Refuelling (A3), interoperability standards among allied nations, feedback from operational experience and appraisals on the next generation of AAR technologies. 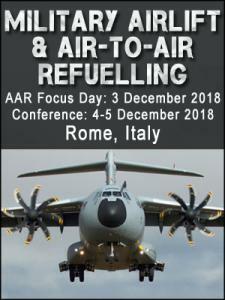 Topics covered throughout the conference after the focus day will include: Air-to-Air Refuelling as a logistical enabler, efforts to maximise safety when deploying AAR systems, ground segment considerations and maintenance, repair and overhaul as well as an analysis of hose and drogue and boom mechanisms for conducting operations. Roundtable discussions will also address the challenges, strengths and weaknesses surrounding Air-to-Air refuelling adoption and output and will feature technical knowledge from leading subject matter experts on how these systems have been adopted. The three-day event features senior leader speakers from: France, Italy, Sweden, the Netherlands, United Kingdom, the United States and many more nations still to be announced. Bookings made by 31st July will be eligible for a £400 early bird discount.